Just finding out about the connection between the 'grain free' dog foods and heart problems for certain breeds of dogs. A friend of mine has a boxer and he was recently diagnosed with DCM. The vet discussed the grain free food as a possible culprit. Her pup is on meds now but only to make him more comfortable and possibly extend his life 6 months to a year as the disease has progressed too far to do much else. We feed our girl Brienne Taste of the Wild (usually mix 2 different flavors per feeding) but it is a grain free food as are all of her treats. It seems that almost all the dry foods are grain free. I would like to find a good quality dry food that has some grain and less legumes to hopefully avoid this happening to her. She is a little over 1-1/2 now and has had no health issues to date. Does anyone feed their dobes Eukanuba? If not, any recommendations for a good quality dry food that includes grains? I'm hoping to find one and then hoping that the grain doesn't cause other issues with her coat or any other health problems. I never jumped on the grain free bandwagon. My choices here are limited so I have fed Nutrisouce, Nature's Variety Prairie and Kirkland. She's always done well on those. And now one of her meals per day is home cooked. I personally feed Proplan. I know others that feed Eukanuba with very good results. Obviously everyone can make their own decisions with the information currently available, and they haven't figured out yet what exactly is going on. Currently, no dogs have been diagnosed with nutritionally caused DCM that have been of food from any of those five companies that meet the WSAVA guidelines. There have been dogs diagnosed with DCM on many of the other companies, including diets with grain, raw, etc. Someone mentioned that looking at the analysis, Farmina follows those guidelines pretty closely to my knowledge (their grain inclusive does) but hasn't sought certification for this. Also I think there has been one case confirmed with Hills but I know it was one of those 5, because most of the groups keeping tabs on this only consider 4 of the 5 to be certifiably safe. My dobie (currently 1 year and 5 months old) was fed Taste of the Wild since he was weaned, so we continued the food (High Prairie recipe) when we got him at 8 weeks up until about 2 months ago. We changed to Purina ProPlan, for various reasons, one of which was being informed by someone here of a class action lawsuit filed against the foodmaker for having found not so good stuff in the food (heavy metals, pesticides). That was in 2018. Apparently there's been another lawsuit filed this year in March for finding lead in their Southwest Canyon recipe. So of course I freaked out because TOTW was all he'd ever eaten. Purina Proplan came highly recommended, and after reading up on the food and looking up the ingredients and reviews, specifically for the Salmon and Rice formula for sensitive skin and stomach, I decided to switch. His coat remains shiny and he seems to love it, and I'm comforted that he's not ingesting any harmful chemicals. Farmina does not meet WSAVA guidelines. No feeding trials on their food (they send their food home with their employees and call those "feeding trials." No peer reviewed research. They have a lot of misleading information. Again, feed what you want, but understand what you're feeding. They use a LOT of marketing just like all the other newer boutique companies. They have also had a case of diet related DCM. Last edited by MeadowCat; 04-14-2019 at 02:54 PM. I never jumped on the grain free wagon. I feed Fromm Salmon A LA Veg. For anyone that is interested in learning more about this topic and is open to the information, there is a good Facebook group moderated by veterinarians. Again, it's NOT just grain-free foods. It's (potentially) a problem with formulation, and dogs on diets WITH grain and grain-free have been diagnosed, including companies like Fromm, Acana, Taste of the Wild, Zignature, Nature's Domain, California Natural, Natural Balance, Merrick, Victor....this is a problem across the industry. dobebug and GameOfDobermans like this. Thanks for the link, MC - I just requested to join. I've fed grain free for a long time with no ill affects. That said, I feed a really good family owned brand - Annamaet. They also have a lot of good formulas that are not grain free. Unless you are local to their area (Eastern Pennsylvania ), you would have to order it on a website like chewey. Fromm is also a really good quality kibble and they have both grain free and not grain free. The important thing is to stay away from wheat and corn. Just like anything, not all grain free kibbles are created equal. I feel pretty comfortable feeding a grain free, but may transition my youngest off of the grain free, but will stick with Annamaet. My 11 year old male has been eating Annamaet Aqualuk grain free for many years, and I'm not changing that. My dogs also get eggs, yogurt, cottage cheese, fruit and vegetables on a daily basis. Nothing against any of these companies, but I personally don't think any of them are very high quality. I know dogs can do well on them..... and I personally fed proplan for many years, but want a higher quality food now. So... I have mentioned this before, but what the Hey. McCoy is basically fed the way Fitzmar (Mary Jo) feeds. He was fed Eukanuba Large Breed Puppy, at his breeder's suggestion until he was 14 months old. He did really well on it. He transitioned easily to Acana Prairie (now Meadowland in the US). So.. I see all the hoopla about grain free diets, but honestly, McCoy does so well on his current diet that I really can't see changing it at this point in time. He is never sick... Never. His last full cardio (Echo, Holter, full blood panel) came back perfect. His coat and skin, could not be better. So until I see more definitive results on the researching of grain free diets and DCM (especially in Dobermans), I really can't justify changing his diet out of some kind of speculation. He just does too well on his current diet. McCoy will have his next full cardio work-up in 4-5 months. BTW. Our last dog who died of DCM related causes was never on a grain free diet. Some of the diet dependent DCM may be related to taurine deficiency....but the DCM that develops in Dobermans is NOT due to a taurine deficiency. Except for my allergic dog (Kip), who got a prescription diet, I've pretty much fed ProPlan Sensitive Skin and Stomach...salmon & rice. Not really anything else on a regular basis, but things like yogurt, eggs, small amounts of fat and skin trimmings (with a little meat attached) from beef and chicken, a little cheese and hot dogs for training....none of them would/will eat vegetables, but would eat a little fruit. All had good coats and were healthy (except my allergic dog). Two DCMs, two clear. Good longevity...almost 14, almost 12 (DCM and allergic), almost 10 (DCM), and 7 (obstruction). Harold DogDog, who isn't a particularly enthusiastic eater, gets the Proplan too. It is the food he shows the most interest in, but he doesn't dive into it the way the others did. He is a dog I could easily free feed...he doesn't overeat and stays at a good weight on his own. But, of course, he's not a doberman. Last edited by melbrod; 04-15-2019 at 01:06 AM. I'm absolutely not telling anyone how to feed their dogs. What you feel comfortable with and what works for your dogs works for you. What I am trying to do is to be sure that the information is out there that there is, in fact, enough of an issue that Tufts is doing extensive research, the FDA is studying it and asking for reports, and cardiologists and veterinary nutritionists across the country are concerned. Thus far, it isn't necessarily a taurine issue, and supplementing foods with taurine does NOT solve the problem. Dogs that have been diagnosed on multiple foods (grain free and not) have often had their DCM improve and even resolve with a diet change to the foods I listed above. It is difficult to consider that what we think we know about dog food may be influenced by powerful marketing, as well as what "everyone" said was "right" about dog food. Again, it's true that it's a small-ish number of dogs, and that Dobermans are likely to get genetic DCM. Consider, though, that this isn't that different than foods that have had a recall, because of something that doesn't cause permanent harm to a dog...people switch foods over something like a salmonella recall, because...RECALL! That must be a bad company. And yet, many foods are now potentially causing damage to dogs, including death. I think it should at least give us pause. For ME, I didn't want any additional factors, so I chose to feed a food that meets WSAVA guidelines, and that I know many people have fed with good results for many many years, from a company that does extensive feeding trials with peer reviewed research studies. Your mileage may vary, and that's perfectly okay. I agree Meadowcat. You have to feed what you are comfortable with and what your dog does well on. Thats how i started feeding raw to Coco and was so pleased that Sugar was weaned onto raw. There is lots of varying research for and against raw but i know the results i have seen for myself that I am comfortable with. If for some reason Sugar did not do well on raw i would switch him to kibble. But so far he is doing amazingly well on raw. Because this issue has come up in a few other recent threads I've probably said most of what I'm going to say here. 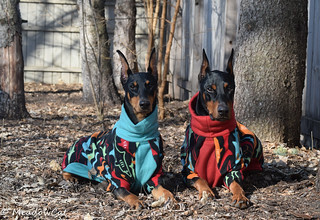 First of all as others have said Dobermans as a breed have a type of DCM which if believed to be largely hereditary--at least very few Dobes who have been tested for taurine deficiency have actually had a deficiency. Boxers, also as a breed have a cardiac issue--one different than Dobes but can end up in the same place DCM ultimately leading to CHF and death. But there are many breed for whom DCM is highly unusual--and enough of those dogs have been found to be taurine deficient to cause concern--and in looking at those dogts to wee WHY they are turine difficient and are DCM dogs because of that is what led to looking at food. But this is all basically in it's infancy and there is a lot more testing to be done before anyone can claim to know exactly what's going on. I've been testing my Dobes for years now--I start testing at around 2 years once a year and continue testing yearly until they are around 8 or when (with Dobes it's kind of always a when, not an if when it comes to cardio/DCM and the signs of increasing failure of the heart) the echos and Holt6ers show signs of heart failure. So linking this to dietary DCM--my dogs wouldn't even fit the profile for a dog with DCM based on dietary issues. I presently feed, and have fed for years as my '[go to' food Purina ProPlan--either Chicken and Rice or Salmon and Rice (now called in their Focus Line ProPlan Chicken and Rice and ProPlan Sensitive Skin and Stomach). I fed a Large Breed Puppy food for a few years to puppies until they were six months or so and then switched to adult food. More recently I've gone back to simply feeding adult food from the get go--most of the foods I will feed are listed as ALS--all life stages. And I've always fed--clear back to the first Dobe puppy in 1959 diets from the bigger companies--at the recommendation of my first vet who said "At least they test them on dogs to see if they work...") And all of them have had grain. 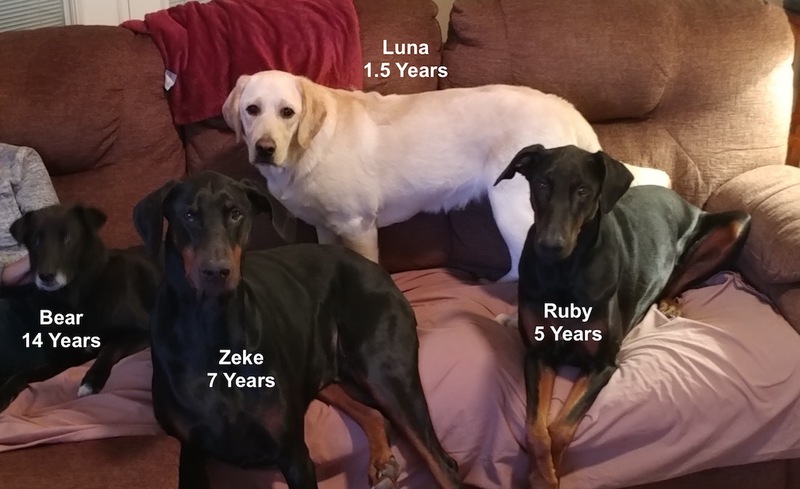 So I've fed Purina, and Eukanuba and Iams...I've had a couple of dogs who needed to be on a prescription diet and Hills had the best one and it worked for 8 years who lived to be 10. My 13 year old Dobe was weaned on ProPlan Salmon and Rice--he liked it at six month when I got him and he still likes it today. Also for the record--from the beginning my dogs get stuff with their kibble--a spoonful of yogurt or cottage cheese with their breakfast and an egg and maybe some meat or canned food (a spoonful) with their dinner. And they've all learned to sit outside the kitchen if I'm cooking and they will get bits of lettuce, tomato, celery, apple, zucchini--or practically any other fruit or veggie I might be using. The Aussie didn't like celery and one of the Dobes didn't like oranges but everyone else felt that "treats is treats". I've never had a dog with a wheat or corn allergy so I'm not picky about not having wheat or corn in the kibble. I worried more about the potato in some of the 'limited ingredient' kibbles and the ones who had legume as the carb source. I had a kind of bad result with a lamb and pea blend that was supposed to be good for dogs allergic to other meats. I tried it as I have tried many other dog foods that came to market with rave reviews--but on the lamb and pea and later with a lamb and lentle food I had the same result--in a month on those diets my dogs started being hard to keep weight on and the coats went from glossy to dull. I also tried some of the grain free mixes--three times--the Aussie was involved with two of them--one Dobe and the Aussie didn't like the food period--the other two Dobes ate it and both ended up with soft stools/diarrhea. That was the first one I tried. The second one the Aussie ate it and so did the Dobes--that time all of the Dobes ended up with very soft stools and one with frank diarrhea. The third time it was three Dobes and no Aussie and it wasn't any better. So even though my reasons are basically from my own experience it has worked for me over the years and now there even is some moderately science supported reason why it's worked. I'll say the same thing that others have already said. Feed what you are comfortable with. With most of the reasonably 'good' foods they will be good enough. Just remember that the testing for dietary DCM is still in it's infancy--there is a connection but it's probably more than being just grain free or just avoiding legume and potato blends. And I know a dog that lived on Old Roy to be 17 years old (a Pointer) and another to 18 on Kibbles n' Bits (a Cocker Spaniel)--makes you wonder sometimes--but there are exceptions to every rule so just be aware of new information as it comes along and don't ignore it because you've never experienced the down side what and how you are feeding. 4x4bike ped and GameOfDobermans like this. I've also fed Pro Plan to my dogs for many years. My Labs were healthy and lived to be 15. My Dobes have done well so far. I alternate between blended rice and lamb and blended rice and beef. My dogs seem to prefer these flavors. I've tried Blue Buffalo and one other brand I can't remember which was highly rated. My dogs did better on Pro Plan. When you look at dog food ratings on the internet Pro Plan does not rate that high. I can only speak of my own limited experience. Currently have 4 dogs. Last edited by DOGMAN45; 04-17-2019 at 03:01 PM. DOGMAN....you've got a handsome crew. Thanks. They are a nice group. We picked the Dobes. The 14 year old mutt was supposed to be my daughter's dog but has been with us all this time. The sweet yellow lab we took over from another family member a few months ago. They keep us busy but they also keep each other busy. dobebug and 4x4bike ped like this. Thanks everybody for the good advice! I think we’ll start slowly mixing in Eukanuba in her food since it’s the food we fed our lab and yorkie when they were around and they did well.